One of the biggest mistakes businesses make is operating under the assumption that a website only needs to be built in order to attract more clients. This mentality is the reason many businesses wind up on the third page of search engine results. Simply having a website for your business is not enough. Your website requires maintenance, just like a car, in order to maximize functionality. Search engines like Google routinely check websites to see if fresh content is being produced. When you add fresh, relevant content to your site your online visibility increases. This means that search engines recognize the effort and reward it with higher placement in search results. A website acts as the public face of your company, and it should reflect the impression you want to make. If a visitor comes to your website for the first time and they see outdated content or old prices, that person is unlikely to return. – What is your niche market? Is your website tailored to your target audience? – Is the copyright on your website expired? – Are all of the images relevant to your business? Are they tagged properly for SEO optimization? – Do you have a latest news section or a company blog? How old is the last entry? 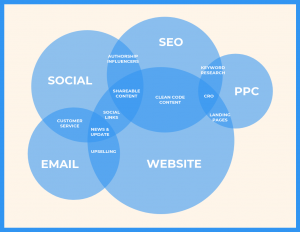 – Does the content contain keywords that are relevant to your business? – Is there a functional customer contact form? – Are all of your products or services listed correctly? – Does your website a long time to load? Are there broken links? Those are only a few examples of how important website management is, especially for small businesses struggling to stand out among the rest. Trust our team to optimize your digital presence and reflect the image you want to show the world.